Q. Where in the UK are you? A. We ship worldwide, contact us if you are outside of the UK and the EU for a more accurate shipping quote. Q. What Brands do you repair? A. Well we are Specialists after all, we repair all brands and all models, we do not specialise in just one brand. Q. Is this website safe to purchase from? Q. How can I trust Fix My Headphones? Q. How can i find my service? A. At the top centre of our website you will see a horizontal bar across the screen with FIX MY HEADPHONES, FIX MY EARPHONES, INFORMATION and SOCIAL. For headphone related services click on FIX MY HEADPHONES and then click on your Manufacturers category. The same applies for earphones, click on FIX MY EARPHONES and then click on your Manufacturers category. 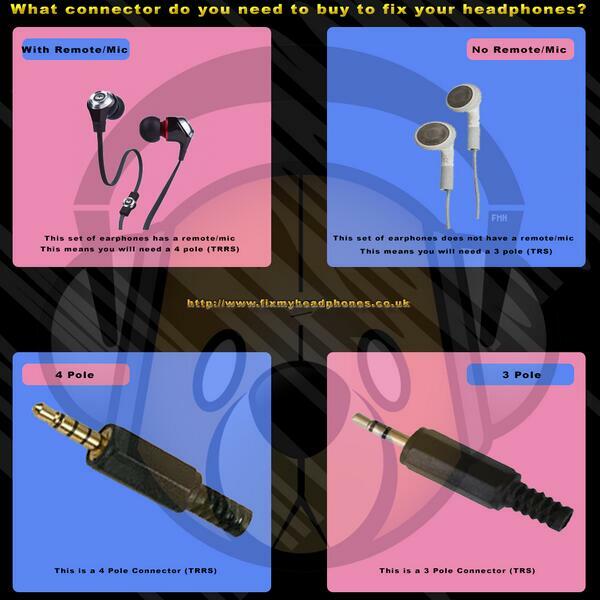 If your service is not listed then simply email us at admin@fixmyheadphones.co.uk for an individual quote. You can also used the search box located at the top left of our website. Q. Your website is not working properly, what should I do? A. The website was designed from a desktop with the display set to 1440x900 this is the ideal view for this website. The website automatically converts to Mobile Views and Tablet Views although you may lose some functionalities on these devices. If the website is not working for any other reason please email us at admin@fixmyheadphones.co.uk and we can support you further. A. The prices includes diagnosis, service charge and fitting and of course. The prices next to our service are final, there are no hidden costs of charges after checkout. Q. How long will I have to wait to receive them back? A. This really depends on how quicly you can get them to us. The average turnaround time for common repairs such as jack repairs and wire repairs is 2-10 days this does not include the postage time of up to 3-5 days allowance for Royal Mail and Collect +, other couriers may vary in delivery times. In general though we repair same day on receipt of the items. If we are unable to repair within this time frame this is due to awaiting parts and this will be communicated via email. For EU and Worldwide the average turnaround time is 10 days from receipt of item/s however we cannot be held responsible for any postal delays. Please note:- On extremely busy periods you can expect to wait up to 30 days, so if you are not willing to wait then try somewhere else. Q. What is a 3 Pole Jack and a 4 Pole Jack? A. Well a 3 Pole Jack is for Headphones and Earphones which do not have a remote/mic attached to them. The 4 Pole is the opposite where they do have the device attached. Take a look at the image below which will help you further. Q. My service is not listed can you still repair my Headphones/Earphones? A. While we endevour to list as many services as possible we do not have them all listed. Just simply email us here and we will individually quote you. Q. Do you sell products to help me repair my own headphones? A. We plan to soon but currently we do not. Q. I need my headphones back really quickly is this possible. A. We treat all of our customers and do not believe in prioritising one from another for monitory benefits. We can however offer a next day delivery service which is available as an option upon checkout, however please bear in mind the job will still have to be completed first this applies to the dispatch process only. Q. I have created an account and have added my order to my shopping cart and paid for it. I did not see a confirmation and no address to post to. What happens next? A. Next your order will be processed, in the meantime get them sent out to us for repair our details to send them to is here. Q. How can I trust Fix My Headphones when creating an account? A. We only use recognised payment methods through reputable companies such as PayPal, Skrill etc. These are all secure methods of payment. Our website is also protected the 256-bit SSL for privacy and protection. We do not share any of your data with 3rd parties or any other organisations etc. Q. I have forgotton my login details how can I login? A. Your login id is your email address. If you have forgotten your password you can reset it here. Q. I am receiving an error message, what can I do? A. Email us immediately so we can resolve this for you here. Q. I have clicked on Facebook discount or Twitter discount, where is my coupon code. A. Email admin@fixmyheadphones for you coupon code. Q. How much is Shipping to UK? A. Return shipping is FREE for UK Customers and sent standard. You are still required to pay for the shipping to us though. Q. How much is Shipping to EU & Worldwide? A. You will have to contact us for a Shipping quote for your specific country if you are outside the EU. If you are in the EU then return shipping is £8.00 you will be required to get these to us though as well. A. Unless you have purchased additional insurance then for the UK the standard time is 3-5 Days. If you purchase postal insurance then shipping is on a next day service. Remember we repair the same day received for most orders unless parts are ordered for the work. Q. What happens is my item get's lost or stolen in the post? A. We cannot be held responsible for parcels lost with postal services. We suggest if you are concerned that you purchase the additional postal insurance. It is rare that items are lost or stolen. For piece of mind insure your items fully and request we do the same upon returning them, select the option upon checkout. Again we stress shipping is your responsibility and if you require us to send your item back via Royal Mail then once we have shipped the item we will not in any instance be held responsible for your package in any way. If you are claiming for a lost package we shall help with your request by signing the relevant documentation. Q. My headphones have stopped working and they are under FMH's warranty period what do I do? A. You return them to us so that we can examine exactly what the issue is. The warranty covers previous work undertaken only. This does not cover any new issues. You must fill out the returns form in your account as it helps us to deal with these issues as a priority. Q. Who pay's for the postage for returns? A. We do not offer any postage funding for customer returning items. The customer will also be held responsible for their item/s to be returned back to them. The warranty is offered only on previous repair work only so be sure your issue is relevant. If any problems arise within 7 days of the receipt of your repaired goods then we will cover your postal costs both way via our chosen method. Again we will not be held responsible in any way for the loss, damage or misdirected parcel. If you require any other questions answering then just email us here and we would be happy to help.